Born in Romania in 1945, Sylvia Bambola lived her early years in Germany. At seven she relocated with her adopted family and saw the Statue of Liberty and America for the first time. But the memory of those years in Germany inspired her to write Refiner’s Fire, which won a Silver Angel Award, and was a Christy Finalist. Her frequent moves as an “army brat” gave her an opportunity to see America and fall in love with her new country. Bambola has authored seven novels, has two grown children, teaches women’s Bible studies, and is learning the guitar. Rebekah’s Treasure by Sylvia Bambola is a Christian historical fiction set around the time of 70 A.D. It features a family of seven: father, mother, four sons, and a daughter. The story’s Point-Of-View switches between the mother’s (Rebekah) and the father’s (Ethan), and that way you can cover more historically than with just one POV, but aren’t confused by too many POVs. Ethan and his sons stay in Jerusalem to defend it against the Romans, while Rebekah and her daughter go to Pella for safety. And so the adventure ensues! Treasure hunting, siege and famine, miracles, idolatry and ravaging, Zealots, Christians, Jews, Romans, fictional and historical figures – they all meet in this page-flipping work. I enjoyed reading Rebekah’s Treasure from the start. It reminded me of G.A. Henty’s work, For The Temple, but more novel/female oriented than battle/guy oriented. I brushed up on a lot of facts and events around the fall of the temple, and felt that Sylvia Bambola put me in the times. I appreciated finding out about the different characters and how they interacted with others and what drove them. I didn’t always care for how different characters treated each other (speaking rudely, grabbing and slapping, rebellious and resentful), but I guess that’s what you get in a fallen world. I felt the ending wasn’t quite resolved. But other than those things, I relished reading it and thought about it all the time until I was able to continue reading it. A fascinating read. I recently finished Rebekeh's Treasure. WOW! Rarely have I read such a spendid Biblically-based historical novel. I loved how the author shared through story her research of Christians and Jews around 70 A.D.! I was touched on many levels -- intellectually, spiritually, emotionally, and historically. . . thanks heaps to Sylvia Bambola for one of my best reads so far this year! I loved this book. I loved it because it is about a time in history that there are no survivors to ask what really happened. The author's take on the past is a possibility. To think that the cup Jesus drank from was being held by a person and not hidden away really made me think. Especially the cup from The Last Supper. There was so much historical accuracy to this book that I felt like I was drawn into the past. This was not a good time for the followers of Jesus, and I was reminded of his sacrifice's for us. He was not the only one that made sacrifices, and it was nice to read about them. I also really liked the parts about the Copper Scroll. I liked the ending and would love to read more books by this author. I am giving this book a 5/5. I was given a copy to review via Book Review Buzz and the author, however all opinions are my own. Cleverly written in the present tense to reflect both views, that of Jewess Rebekah and husband Ethan, this story is taking us back to 70 A.D. and the fall of Jerusalem. Surrounded by the Roman armies, the Holy City's outer walls breached, the Jews witnessed the ransacking of their Temple, its treasures to be eventually taken to Rome as victory spoils. The ensuing rebellion lasted another three years before its culminating in Masada. Rich in historical facts, this fictional account highlights tumultuous times for those who followed Christ. Separated amidst chaos and despair Sylvia Bambola's protagonists flee, carrying treasures like no other: Rebekah with the cup our Lord held at the Last Supper, her husband with a precious scroll referencing the location of a capacious Temple's hold. 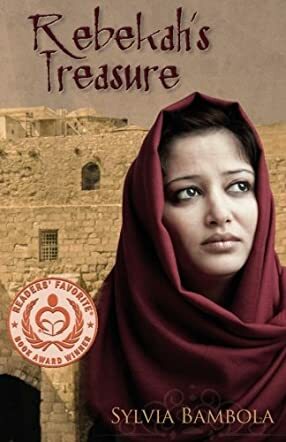 An excellent read from a great storyteller, Rebekah's Treasure is an emotional recount of faith, love and friendship at the beginning of Christianity. Includes historical references, glossary and a reader's group questions. A Thoene fan, I felt none the less this novel well worth 5 stars! Disclaimer: I received a copy of this book from BOOKCRASH as part of it's promotion. I am disclosing this in accordance with the FTC 16 CFR, Part 255 'Guides concerning the use of endorsements and testimonials in advertising. I was not asked to write a positive review and all opinions expressed are entirely my own. As the story is developed and the characters come to life the reader is taken into the 1st Century. Believer's are trying to flee the city and the persecution they are experiencing at the hands of Rome. Rebekah is carrying the Cup of the Last Supper and her husband, Ethan, is charged with guarding and using the treasures of the Temple. Their journey's include caravan robbers, lack of food and water, intrigue and mystery. Rebekah's Treasure by Sylvia Bambola is a wonderful addition to any library. It is 70 A.D. and Jerusalem is being taken over by the Romans and the Jews are leaving to escape being tortured, killed or made slaves. It is written from the view point of both Rebekah, who is sent away by her husband from the Temple and Jerusalem to keep her and her daughter safe, and her husband Ethan who stays to fight with his sons and try to save the Temple. It is a remarkable book about love, faith, family, and perseverance through a tumultuous time for the Jews and Jerusalem. I loved this book. It leads you on a journey seen through the eyes of Rebekah that takes her to a new life with the believers of Christ in Pella. She is a strong woman whose faith sustains her through all she has to face in the new town while her sons and husband are in danger fighting to save the Temple and Jerusalem from the Roman's who are taking over and destroying everything and everyone. It is a emotionally charged book that you get swept up in right along with Rebecca and her family. It also is well written from Ethan's point of view showing how devastating and brutal the struggle for the Jews were in trying to keep the Romans from overrunning Jer4usalem and Killeen all the rebels and Jews that are still living there. It shows the strength of the Jewish people and their perseverance in the face of the enemy. If you love a great emotional, action packed, faith building, historical novel then you must read this book. It is a great insight into the struggles and devastation the Jews at the hands of the Romans as well as rebel factions of Jews. Rebekah and Ethan each have what they think is the treasure they have to save, but in the end they find the true treasure isn't in objects and the journey to realizing this is one we can all relate to in our life. I was moved by this book and it was a journey that I am glad I didn't miss. I can not recommend this book enough. I hope you will get this book and read it and join me in finding a true treasyre of a book. I would recommend this book to anyone who likes Christian and Jewish history. I would have liked to know Rebekah anbd her family. The author does a great job of integrating her story into historical happenings, and the life of Jesus. This is a great window into life in Jerusalem in 70 A.D. It is also a story of hope and faith in the midst of death and destruction. Sylvia Bambola does an excellent job of describing the many interactions and lives of the characters in this book. It took me to places where very few novels have succeeded in doing over the past few years. Her author's commentary lifted me up. Indeed, "Come Lord Jesus." We await You. I enjoyed the book and liked how the author used religion and history in the novel. I would certainly recommend thus book to others to read. Sylvia Bambola in Rebekah's Treasure presents a captivating story of a Jewish family in 70 A. D. as Rome is bearing down on Jerusalem. Bambola weaves such rich historically accurate details within her writing they bring the story to life, enhancing it while educating the reader. Never boring as some historical fiction can be and certainly not wimsy she draws in her reader's attention and emotions. Bambola's depiction of this slice of time comes to life through her vivid backdrops, her passionate storytelling and beautiful characters. Her creativity and brillance are evident in the characters she creates and the depth to which she develops each. She invites her readers into their lives, their inner struggles, and their intense love and commitment to each other. When their heart's break our heart's break. Her writing style is unique in that she writes in first person through Ethan, the father and Rebekah, the mother. She does so by changing voice between chapters. Rebekah and Ethan are seperated early in our story. Ethan and their four sons are soldiers and are commited to staying in Jerusalem regardless. Ethan secretely has Rebekah and their daughter smuggled out of Jerusalem as he know their fate once Titus and the Roman army arrive. Months of separation saturated with much turmoil and devastation befalls both those with Rebekah and those with Ethan. As we continue to hear our story from this mother and father's viewpoint we experience battles, bloodshed, miracles, mysteries and an ever present sense of danger. Bambola pencils these in such a fluid manner the pages seemed to turn themselves. Yes this book is greatly entertaining. Without spoiling the end let me just say as powerful as the book was I was not prepared for the purity of love and sacrifice in the end. Beautiful. Life changing. I had not heard of or read Mrs. Bambola prior to this book. I picked it up to read and review as part of an early review process allowing me to receive the book free. I never anticipated experiencing such a poignant work. Seeing and being reminded of the early church and even more so the work of the cross with such passion challenged me as a person.